Snakelocks Anemones, Anemonia viridis, are found on the southern and western shores of Britain and as far south as the Mediterranean Sea. They are distinguished by long flowing tentacles and will usually be found in a bright green colour, sometimes with purple tips to the tentacles. A few specimens have a scarlet on their tentacles. The anemone contains a symbiotic algae called zooxanthellae that are found in the anemone's tissues. These algae are necessary for the long term survival of the sea anemone. When the numbers of algae diminish the anemone may appear dull grey in colour. The algae need light to flourish, so Snakelocks Anemones will be found in the sunniest pools. 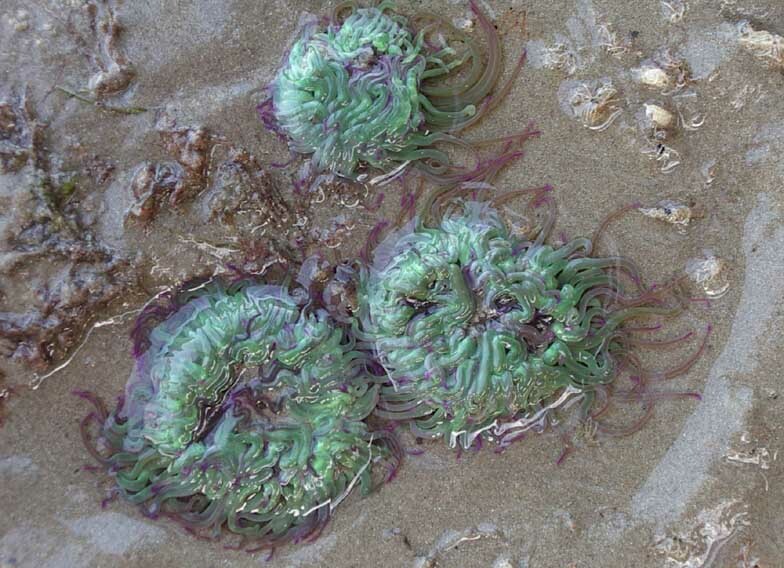 Unlike Beadlet Anemones, they do not readily retract their tentacles if left stranded on land by the retreating tide. However, in aquaria they demonstrate their ability to do so. Correction: the green colour is because of a green fluorescent protein, common in corals, sea anemones, and some other cnidarians. Information provided by Vicki Pearse (President, American Microscopical Society). Snakelocks Anemone can capture small fish and other animals in their stinging tentacles. Longitudinal Fission. Anemone splits into two identical halves, as illustrated (click on the link below). The process can take from between 5 minutes and 2 hours. Pairs can often be seen on the shore in spring. You have to join (its FREE) and then search under the scientific name of the anemone %/or Longitudinal Fission. Intertidal pools and shallow water. Requires high intensity light levels (e.g. 50000 Lux is natural in summer, 16000 Lux will probably suffice in aquaria) for the zooxanthellae symbiotic algae in its tissues. Tissues contain zooxanthellae symbiotic algae which appears to be necessary for the long term survival of this sea anemone. Ingests larger food items both dead and alive, e.g. small fish, just moulted palaemonid prawns. Gastropod molluscs and all sorts of crustaceans form the bulk of the diet in limited studies. The Snakelocks Anemone Shrimp, Periclimenes sagittifer, has now been discovered in Babbacombe Bay, south Devon. This sea anemone is symbiotic with the Snakelocks Anemone, Anemonia viridis. They were first discovered around mainland Britain under Swanage Pier in 2007. Before this report, the most northerly sightings were regular reports from around the Channel Islands. Numerous Snakelocks Anemone Shrimp, Periclimenes sagittifer, were found during a dive off Swanage Pier in Dorset. 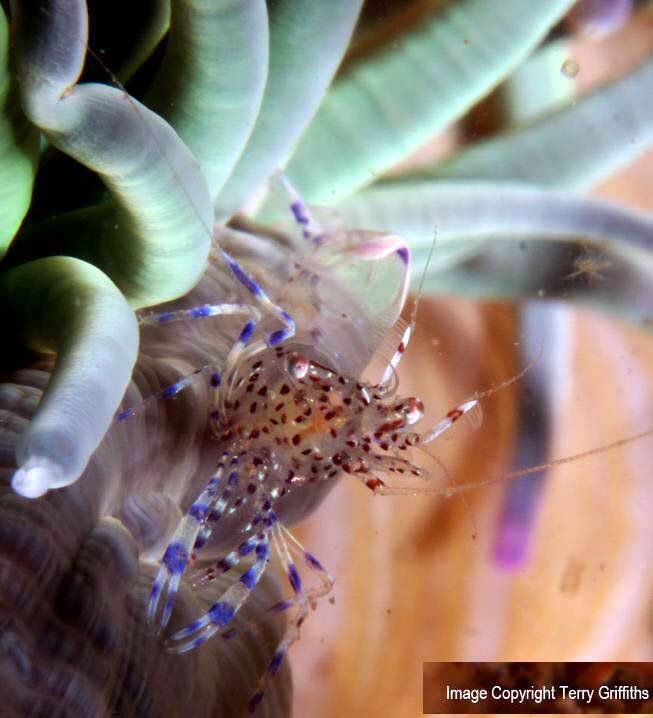 These small colourful shrimps look blue amongst the green tentacles of the sea anemone. 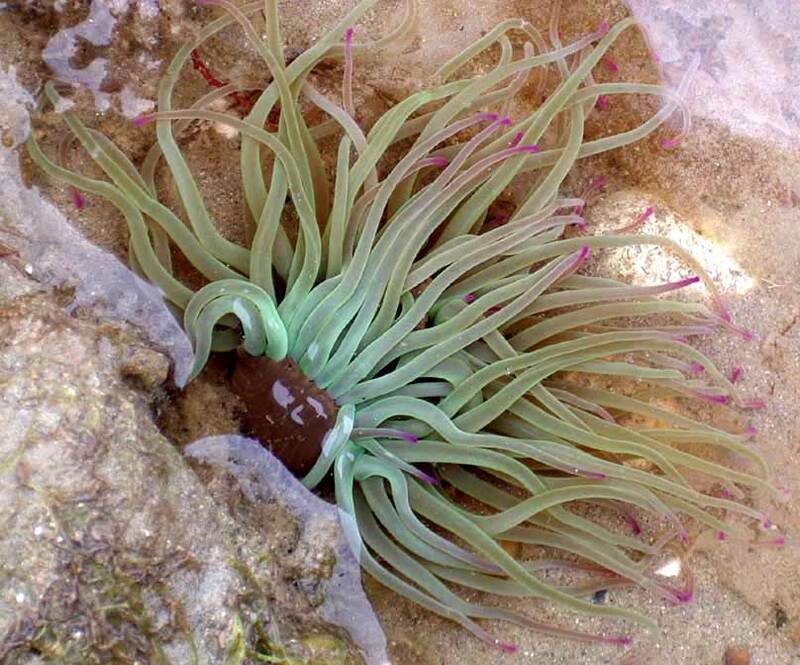 They can reach about 30 mm in size and usually live symbiotically with the Snakelocks Anemone, Anemonia viridis. This is the first known sighting of Periclimenes sagittifer in the shallow seas around mainland Britain. Before this report, the most northerly sightings were regular reports from around the Channel Islands. When poked with fingers the tentacles feel incredibly sticky to the thick skin. However, when grazed on by the abdomen the tentacles can sting and raise a rash, which can last a month. There have been several reports in 1999. This anemone was responsible for a severe blistering of a baby's leg on a Guernsey beach in August 1999. The sting can be worse than that of the jellyfish around Britain. 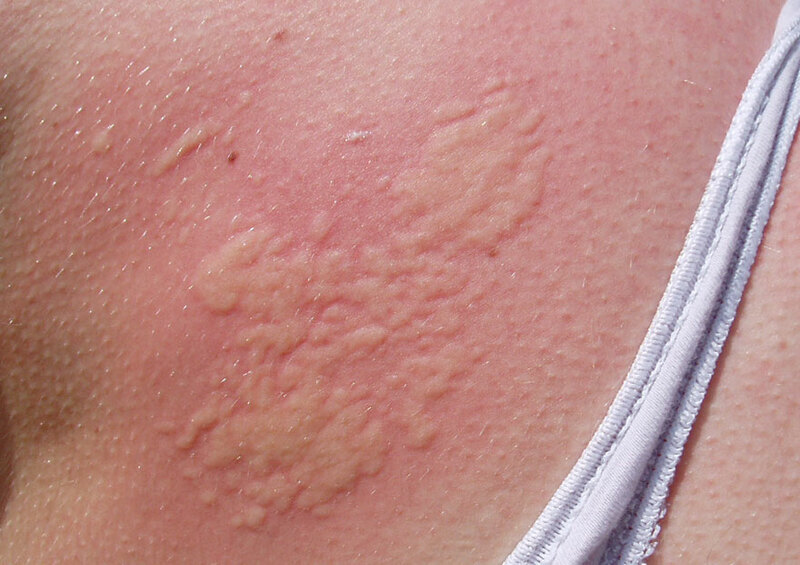 "I got stung by something caught up in a thick canopy of Sargassum at Kimmeridge, Dorset, in July 1999 - it bubbled up like a severe nettle sting, then turned red as it subsided to leave red weals which I still have a trace of on my stomach (over a month later). I guess it was an unusual reaction to Common Jellyfish as I didn't see any Cyanea that day." "Swimming in Chesil Fleet through' some Sargassum, I felt a mild tingling sensation across my abdomen. This was caused by Snakelocks Anemone! The scars from the weals lasted for a couple of years ! Obviously, the skin on fingers is too thick to be vulnerable." A snorkeller was stung on the soft skin on the underside of her forearm producing a large red weal after diving at Kimmeridge, Dorset. After 6 weeks the weal had almost disappeared, but it still itched. I remember years ago seeing a boy messing about with these anemones and developing a sudden and painful line of weals on his inner arm. (Peter Glanvill). This rash on a young girl came after playing in a rock pool. I was recently in the Purbecks in Dorset and whilst my daughter was swimming in a rock pool (at Dancing Ledge) she was suddenly stung by 'something'!! There were no jelly fish in sight and we weren't sure what caused it. The sting was very painful and when it eased off, very itchy! Just after she was stung, the marks on her arm and leg were similar to those you get when stung by stinging nettles ( raised and white blotches). The marks, as shown in the attached picture, are now raised and red with 'a kind of tickly feeling' when touched. Could this be some kind of stinging seaweed?? Is there such a thing in the coastal waters off the UK? 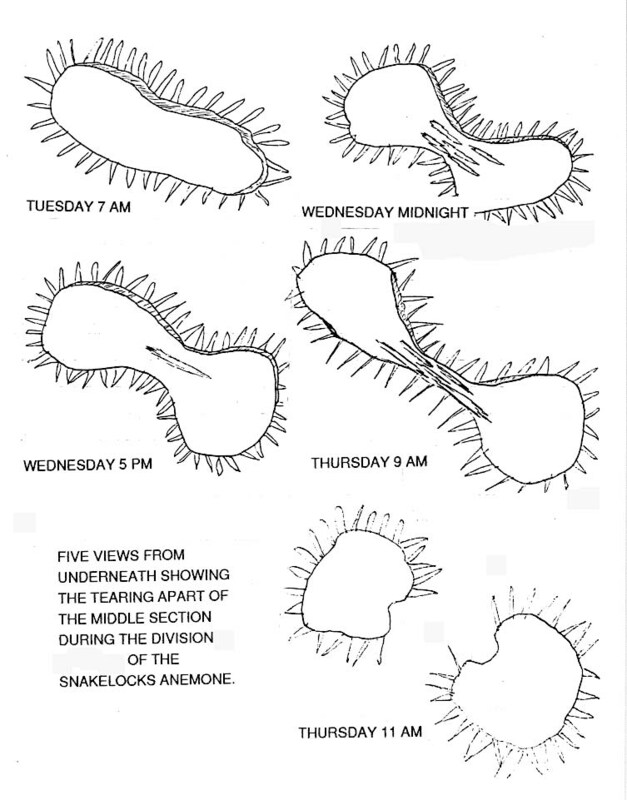 I am writing to inform you of a recent incident with Snakelocks Anemone. I was badly stung all over my back and bottom a week ago whilst in a rock pool at Dancing Ledge in Dorset, part of the Purbeck Coastline in the south west of England. 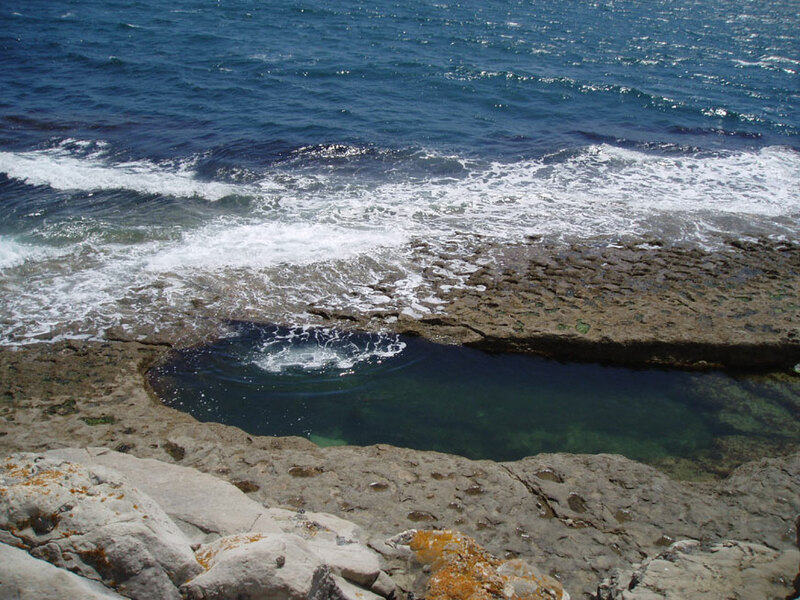 There is a particular rock pool that was artificially created by a headmaster of a local boarding school sometime in the early 20th century. It forms a perfect intertidal swimming pool that attracts lots of families and bathers like myself. I was in the pool for some time leaning and sitting on the edges. I did feel a small sting quite early on but thought it was an open cut or graze from scrambling on the rocks before getting in. After a long swim in the sea as well, I got out and immediatley felt a rapid burning sensation like my skin was on fire. The area bubbled up in patches, very similar to a dense collection of nettle stings. Interestingly, the stings on my bottom form a neat and rather unattractive line on the edge of my bikini bottoms. There were other people in the water at the same time but they had long shorts on or wetsuits, so the stings couldn't penetrate. I did hear from another swimmer that a little girl who was only wearing a bikini like me, had also suffered an attack. I took the attached photo about ten minutes after getting out of the water. The area remained very hot and very very tender for about two days. During the following week it began to go down then it formed in red welts that look like chronic eczema. It's become itchy and inflamed and I started to use calamine lotion again to sooth it. I hope that you will publish the photos and the story to warn people, particularly with young children, that this rock pool has a large concentration of Snakelock Anemones. Do you know if there is a risk of scarring from such attacks? I sincerely hope not! I very much look forward to hearing form you. Please let me know if you require any further information. 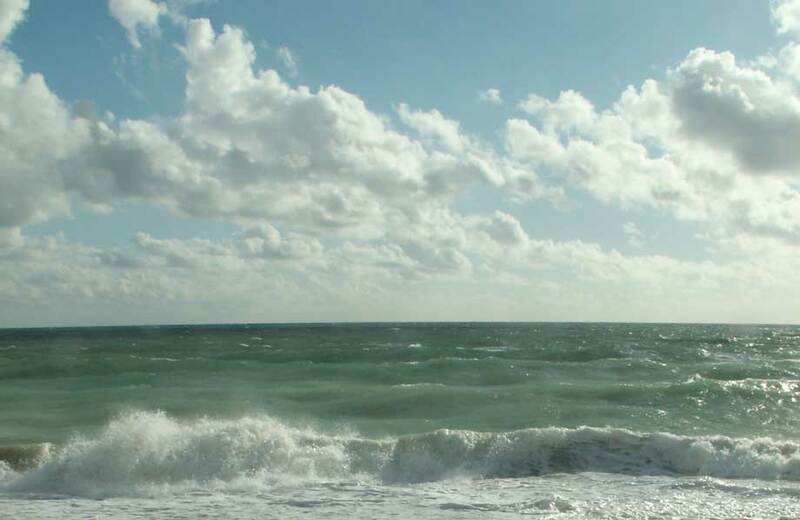 Most easterly point found regularly on the northern coast of the English Channel, is Worthing, Sussex. In the wild, this species will not retract its tentacles, although in captivity it has been shown to be able to do so. Sea Anemones fight over territory. The red Beadlet Anemone, Actinia equina uses its acrorhagi (blue beads) and the green Snakelocks Anemone, Anemonia viridis uses its long tentacles. pic. Neither "catch tentacles" or acontia have been observed in this species. Ref: Simon Davy, Zooxanthellae in the tissues of British sea anemones (Coelenterate Society talk at the School of Ocean Sciences, University of Wales, Bangor). Small long-legged spider crabs hide beneath the tentacles of this sea anemone, as well as the prawn Perciclimenes sagittifer. Photographs can be found on the following site. Click on the logo. Meadfoot, south Devon, on a previous occasion the middle shore numbers were about 50 per square metre, in places the edges of the small pools were continuous Anemonia viridis effectively preventing anything else living in the pools. Meadfoot is a rocky outcrop in the middle of a sandy beach. A most unusual appearance on Kingston Beach was a solitary Snakelocks Anemone, which reach their most easterly point of distribution up the English Channel (northern coast) at Worthing, with an occasional stragglers on the shore at Shoreham, and almost entirely absent from Brighton. In my aquarium a small Snakelocks Anemone, Anemonia viridis, has a basal diameter of 20 mm and a long tentacle stretching out of 210 mm. NB: The two anemones in the foreground of the main photograph are Anthopleura ballii.